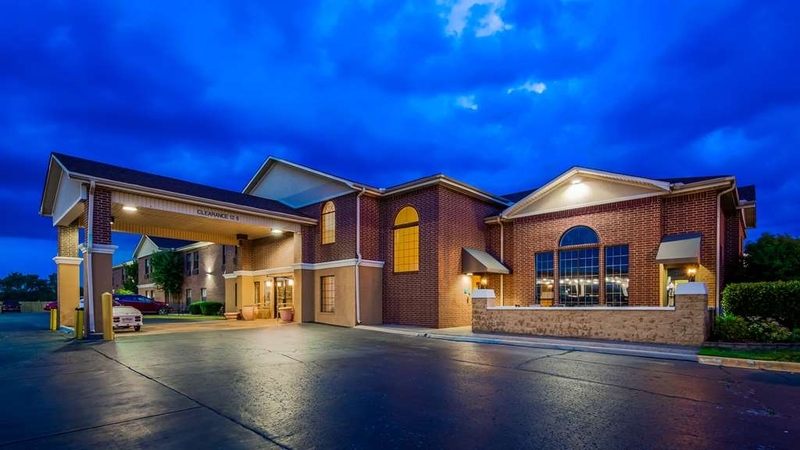 El Best Western Plus Lonoke Hotel se encuentra en el centro de Lonoke. Venga y disfrute de las mejores atracciónes turísticas cerca de nuestro hotel. Precios bajos garantizados y ofertas exclusivas. Nuestro hotel, un oasis de paz y tranquilidad en Lonoke, goza de una estratégica ubicación junto a las excitantes atracciones de la zona, empresas locales, restaurantes y tiendas. Con un fantástico acceso a la carretera interestatal 40, este hotel le permite disfrutar de una gran proximidad a todas las emocionantes atracciones de la zona. Disfrute de su tiempo libre en las numerosas opciones de ocio de los alrededores: las pistas de bateo de béisbol Sluggers, el Parque Conmemorativo Waggoner, el campo de golf de Lonoke o el club de tiro Remington Arms Gun Club. A tan sólo 40 kilómetros de Little Rock, podrá disfrutar de una auténtica experiencia cultural en la Biblioteca Presidencial y Museo William J. Clinton, zambullirse en las piscinas del Wild River Country y conocer los 725 animales del Zoológico de Little Rock. Si es un aficionado al deporte, nuestro hotel se encuentra ubicado junto al distrito escolar de Lonoke, donde podrá contemplar los mejores torneos deportivos locales. Este hotel de Lonoke está ubicado junto a las principales tiendas y restaurantes de la zona. Si se encuentra en viaje de negocios, nuestro hotel le garantiza una estancia realmente productiva en Little Rock, puesto que importantes empresas como Arkansas Rural Water Association, Remington Arms y Maybelline L'Oreal se encuentran a solamente 24 kilómetros o menos. Además, el aeropuerto nacional de Little Rock se encuentra a solamente 32 kilómetros de distancia de nuestro hotel. Siéntase como en casa en las amplias y modernas habitaciones de este hotel de Lonoke. Todas nuestras habitaciones cuentan con televisión por cable o vía satélite, acceso gratuito a Internet Wi-Fi, microondas, nevera, escritorio, sillón ergonómico y mucho más. Disfrute de nuestro delicioso ycompleto desayuno gratuito todas las mañanas con sabrosos cereales, fruta, huevos, yogur, jugos, café, platos calientes y mucho más. Relájese mientras disfruta de un baño en nuestra fantástica piscina cubierta climatizada con solario. Este hotel exclusivamente para no fumadores de Lonoke ofrece, entre otros servicios: centro de negocios, servicio de lavandería, gimnasio abierto las 24 horas, estacionamiento gratuito y tienda abierta las 24 horas. Nuestro cordial y profesional personal, además de nuestros excepcionales servicios, le garantizan una estancia de primera en este asequible hotel de Lonoke. Realice su reserva hoy mismo en el Best Western Plus® Lonoke Hotel. A very good place to stay east part of Little Rock. Personable employees, clean room and facilities. We'll stay here again when we travel through this area. Breakfast items were less than expected but sufficient. "House keeping saved the day"
This is a very nice best western. It is right off the freeway and close to conveniences. It is quiet, comfortable and clean. Great and helpful staff. I left my earrings. Before I missed them, the staff found them and called to send them to me. arkansas at its best. A very nice place to stay. a little older than some Best Westerns but very clean and the bed was wonderful. The front desk was very hellpful and the internet was working well. Would stay here again any time we are in the area. 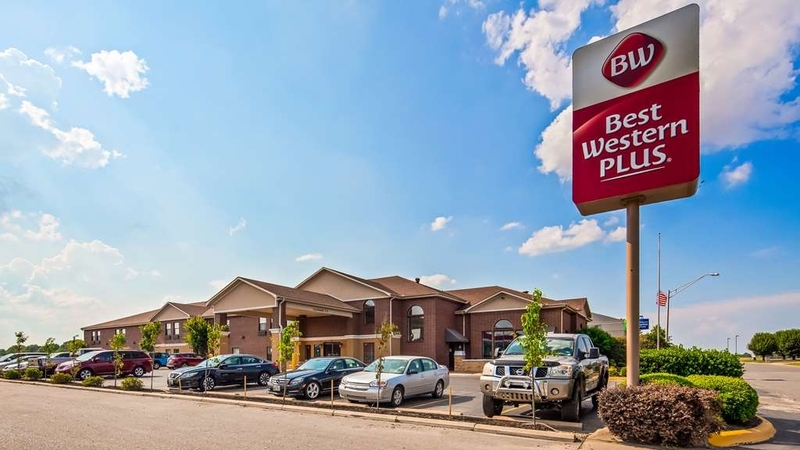 "maybe the best Best Western for service"
"Best Western Plus (Had never heard of Plus)"
Welcoming place to stay....be sure and join their rewards program so you can get $10 off your next stays. Breakfast was cheese omelets, sausage, waffles (you make) with great toppings, and several continental items to choose from. 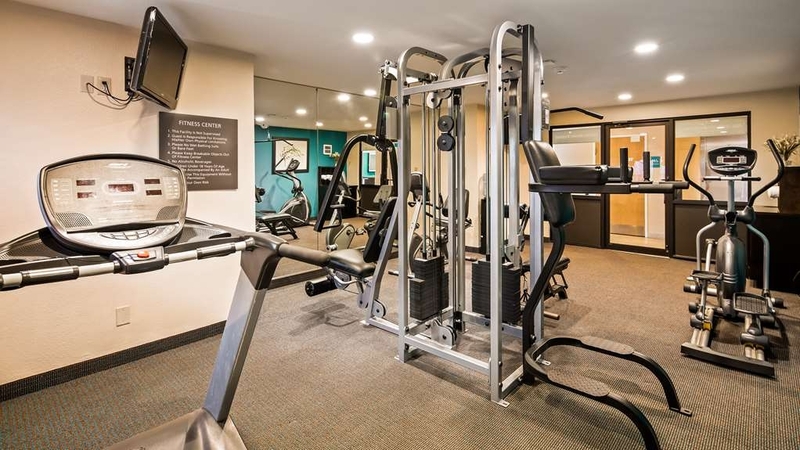 So the Plus....that's plus fitness center, pool, and breakfast. Good fast place to stay off the interstate...no bar FYI. Having stayed at this property in the past , like the location . Decent rate. Bed ok. Breakfast could be improved. But would stay again. Several hotels at this exit, but prefer this one and a Best Western member, The TV would be nicer if it was high definition and more clearer. "Dirty Rooms & Dishonest Maids"
My family stayed here for one night to attend a funeral. We checked in & got on the elevator which sounded like it was going to fall apart...we got in late & went straight to bed...upon waking the next morning, we found hair everywhere in the bathtub! There was a huge gap in the door where it didn't connect all the way when closed, which allowed for a lot of light from the hall to enter the room while we were trying to sleep. The heating unit didn't warm the room like it should, not to mention that it was 60 degrees in the room when we checked in...not very comfortable when coming in out of 20 degree weather. After checking out, about half way home, we realized my daughter left her memory foam pillow in the hotel room. We immediately called to let them know & we were told it was nowhere to be found. This pillow could not have been mistaken for theirs as the pillow case was gray flannel with dogs on it...after a few days, we call back to ask if it had been found & again was told “no & we are not responsible for items left behind”. So basically, if you leave something there, it becomes the property of whoever finds it! I would strongly recommend that you go next door to the Hampton! What a find this hotel was. We were hoping to get on the other side of little Rock and happened upon this hotel. It was great! The location was convenient. It had a pool for the kids and a very comfortable room. The breakfast was great and the staff was super friendly and helpful. I would definitely stay again. This hotel is just outside of Little Rock. It should not be considered a "plus" hotel. Unfortunately, there is not much surrounding the hotel as far as eating establishments. We had to wait to check in as the clerk was away from the desk. The room was okay but there were very few television stations and some of them were a bit fuzzy. The breakfast was hotel standard fare: eggs, omelets, sausage, biscuits, toast, and a few pastries. We enjoyed our stay and the beds were so comfy! the breakfast bar had a good selection and we had fun splashing around in the heated pool as well. the rooms had everything we needed plus extras. good! "Lonoke (or is it Lonoke)?" We had a good time, great sleep, good food, easy location. We plan to use this hotel again when we make another round trip to Pennsylvania for family business/pleasure. We always feel like family here. While the hotel was updated and my room was very clean. The walls are thin and all you could hear were doors closing and people talking in the next room. As I said the room was clean and updated the toilet didn't flush and it smelled like a musty old basement in the room. Thank you for your feedback, we will use this feedback for training purposes. "Awful. Do not stay here!!" Thank you for your input we will use your information to address the situations you encountered. "nice hotel facilities but odor was horrible"
There was an odor that was really bad....smelled it as soon as you came through the door. It was a medicinal/cleaning smell....but not pleasant at all. We had 4 rooms and went straight to Walmart to find something to cover it up. Only one girl working on a Saturday night and she was doing her best to accommodate everyone but it was too much for one person.....I really felt sorry for her. We had a great night stay with comfortable beds, the staff were friendly. And our room was clean and fresh. The pool was a refreshing end to the long day of travel. And the hot breakfast was a good start to the day! Thank you for taking time to write a review so that others can know where to stay while they are in the area. May your Travels be met with Safety, your Journeys be filled with Memories, and your Adventures be Often. My husband and I stopped here after driving 600 miles and were tired, hoping for a comfortable bed and pleasant stay. We were not given either. In fact, I don't believe this hotel meets the "Plus" rating of Best Western at all from the hotels where we have stayed in past years. The ice machine was broken on the first floor, the pool was broken. The bed was hard and the whole hotel smelled stale. Also, there are no restaurants nearby except the Waffle House. Virtually no places to eat--anywhere. So, bring your own food or snacks with you! Best thing I can say is that we didn't sleep on the street or in our car. It certainly did not meet our expectations at all! Stayed here June 24 checked out the 25 . Was not a best Western plus. Should be rated less . Ice machine on the first floor was out so I walked to the 2nd floor like the sign said and only got two cubes out of the machine. The pool was out of order too. Breakfast was only 6 AM to 9 AM this should be longer . The sheets felt itchy .The room had a slight odor. Stayed here on my way to Arizona with my two children. I had no problems checking in. My children rushed to the indoor pool, where it was extremely humid, and the water was murky. The room itself was nice. Breakfast began at 6am, and at 6:30, there was nothing available to eat except for waffles. They had one person setting up breakfast and checking people out. I was disappointed that I had no meal choices. We had our waffle and hurried on our way. Clean enough. Price was okay. Breakfast was lacking...we ate early on a Saturday and lots of things were out. Eggs were dried out. Coffee was good. The whole place smelled a little odd. Smoke free property, so that was nice. The bedding at most Best Westerns drives me crazy! The pillows are ridiculously small, but the worst thing is how they make the bed where the comforter doesn't cover your shoulders unless you either scrunch way down in the bed (which leaves no leg room) or untuck the comforter from the bottom of the bed and re-make it (which is a pain)! Why can't they just make the bed properly?!! My needs when traveling include a clean comfortable room, friendly helpful staff, good breakfast and a reasonable rate. 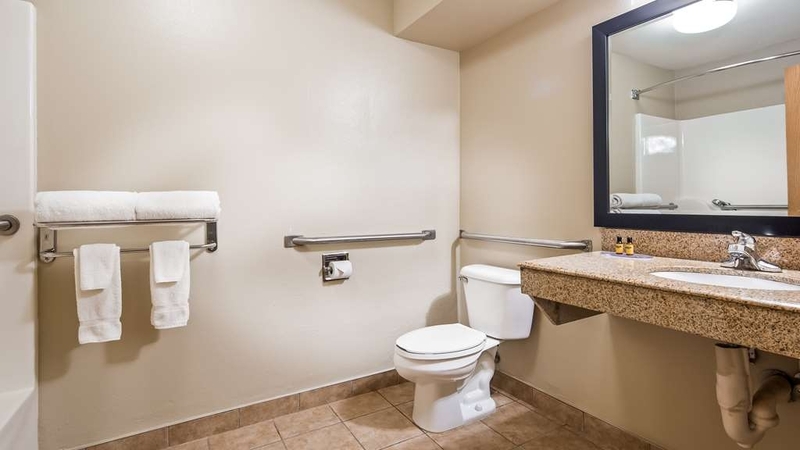 This Best Western meets those needs. It is located near I-40, but is quiet. There is a pool and workout room. I discovered it on a trip west and chose to stay again on the return home. If you like mexican food be sure to check out the Mariachi restaurant next door. Nick's Bar B Q (which also has great catfish and burgers) is the next exit on I-40. Room was nice had slight odor but nothing major and I think someone had spilled some perfume also. Bed was very comfortable. Morning breakfast was great. And thanks for having the easy clean remotes. It was a good stay. Friendly and helpful staff, plenty of parking and an area for pets to run in rear of property. Restaurants and a Walmart within walking distance. The room and hotel look to be recently updated, with modern deco and amenities, very nice for the price. It is clean and quite. Plenty of safe parking. The staff is very nice and helpful. The rooms are clean and everything worked as should. The beds were clean and comfortable. The breakfast was good and the breakfast area was very clean. Very easy to get to from the interstate. "Quick trip to see friends"
We took a spur of the moment trip to visit friends in Lonoke Arkansas and chose Best Western because they were pet friendly. The room was well furnished and clean. The staff was very helpful and curteous. They provided a nice breakfast with waffles, Danish,eggs, biscuits and gravy and sausage and cereal. We felt very safe and comfortable there and will definitely be returning! "the Best Best Western in Lonoke"
"Overnight stay on the road"
A pleasant stop on the way home. Very clean room and pleasant staff trying very hard to please. Special breakfast well prepared and presented. The area has only fast food joints close by, but the Subway nearby had a lady who made salads like your Mom. "hotel was clean, quiet, nice but"
But, I forgot our swimming suits hanging in the bathtub to drip dry and left without them. My suit was from Dilliards and cost well over $100, husbands just a regular suit. I called the hotel the afternoon we checked out, no had turned in a suit, I described it and left phone number. I have called the last 3 days inquiring, no one, not even the lady who cleaned the room has found a green/blue/black bottom halter top suit. I stayed at a hotel in San Diego and then went on cruise to Canada, left a drawer full of sweaters and slacks, they shipped them to my house all accounted for, none missing. Don't leave anything behind, hotel is not responsible and it says it on paper you sign. "I'd stay again, and again, and again"
Enjoyed our stay here. Only stayed one night as passing through town but check in and out were quick and painless. Staff professional. Breakfast okay, average for night with buffet breakfast included. Friendly people. Comfortable decor and attractive breakfast bar. Love that dog is welcome at BEst Western motels!! Travel with small behaved dog. She has traveled by car and airplane over 200000 miles. Tried other motels but unhappy with their cleanliness. I am a loyal customer!!! The room and decor are nice. Room was clean. The thing that keeps me returning to this hotel is the staff. Some of them have been here for years, and they always remember me. But, even the newer people are very friendly. The breakfast attendant is very engaging in conversation, and she almost makes you feel like you are in a "service" restaurant, rather than buffet style breakfast bar. I have never had an issue here that was not immediately resolved by the girls at the desk. To me, it is worth the money I spent & I will keep returning. Everything was good about this place. Check-in service was friendly and fast. The room was very nice and clean. The beds were comfortable and the sheets were soft. Wifi was fast. It was quiet. Breakfast was good. Check-out was a breeze. Easy on and off access to I-40. We frequently stay at this motel and we have never been disappointed. The staff is excellent - friendly, helpful and ready to be of assistance. I would recommend this Best Western Plus to anyone going through or staying in Lonoke, Arkansas. "Excellent Property. Clean, Efficient, and Customer Friendly." Customer Service is Priority No. 1 at this property. The new management was clearly in control of their facility and personnel. The property was extremely clean and lighting in the parking lot was good. Breakfast was plentiful, hot, and ready on time. I would highly recommend this property to anyone and I will stay here again when I come to the Lonoke area. We stopped over for the night-checked in at 9pm and left at 5am. The front desk staff was very friendly, the room was clean, noise wasn't an issue, and the bed was very comfortable. We have it on our list to stay at again. The rooms are clean and nice and the hotel staff go over and above to make sure you are comfortable. Great price also. The location is great, easy on and off the freeway. Convenient to Wal-Mart. Great! Our room was spacious and fairly clean. The bathroom floor could have had a better cleaning, there was hair on it. The bed was comfortable. Our biggest complaint was that when we went down for breakfast there was no breakfast. The room was dark, chairs up on the tables, no one present. We went to the front desk, no one there, a bell that didn't ring. When we spoke loudly a manager came out, checked to make sure there was nothing out, and went back behind the wall calling out she would set something up. We did not have time to wait so went to the McDonald's across the street. We were not the only ones looking for breakfast. Seems like the manager should have known there was a problem and taken care of it instead of being so surprised. The staff were very kind and accommodating. The room was immaculate and the beds were very comfortable. Our breakfast was hot and the coffee was delicious. The property was kept up nicely on the outside as well as the decor on the inside. "Makes you feel like family!!" Our family had been traveling most of the day. We stopped for an overnight rest. The hotel was clean. Check in was easy and fast. The room was very spacious, and clean. The shower had great water pressure as well. The bed was so comfortable!! Breakfast was very good the selection was great. There is a new manager there now, Tyler, he went out of his way to answer a question that I had asked the front desk lady and she did not know. He came to the desk even on his day off to give me the answer. That was a refreshing change that made me feel like I was special, and important to them. Thank you for an amazing stay. We were refreshed to finish our trip. This Best Western is very good. The rooms were well appointed and clean, everything worked. Staff was helpful, courteous and professional looking after all our needs. Well located with lots of restaurants nearby. We were very satisfied with the place. Check in experience was very welcoming. We felt the rate, although we had enough points to get a free night, was on the high side but that seems to be everywhere. Disappointed that the military rate isn't as good as other discounts. We told Jennifer at check in she makes us feel that we would stay here again. From the time we checked in we felt it was wrong. Manager on duty was unkempt and seemed a bit like she couldn't care less about anything. Upon entering our room, my wife turned down the bed. Sheets were very wrinkled. Human hairs present. Debris present on the sheets. I noticed the pillows were very wrinkled too and had been fluffed but not changed. We called down and got another room. Walking into the second room about knocked us out. Smelled skunky like old Corona beer. There was no smell of clean to be detected. The toilette wasn't clean. One pillow had a mascara smudge on it. The sheets were wrinkled as if they had been slept in. My wife and I had been driving for 6 hours and were ready to crash. We did not need this experience. We checked out and stayed at the Hamilton just about 50 yards away. Someone needs to get some new staff in that place. It also needs some renovation - it's old and wearing out. Clean, comfortable and in the middle of nowhere but there was an excellent Mexican restaurant next door. Would stay again if in this area. Not a tourist mecca but a small town where people were friendly and helpful. 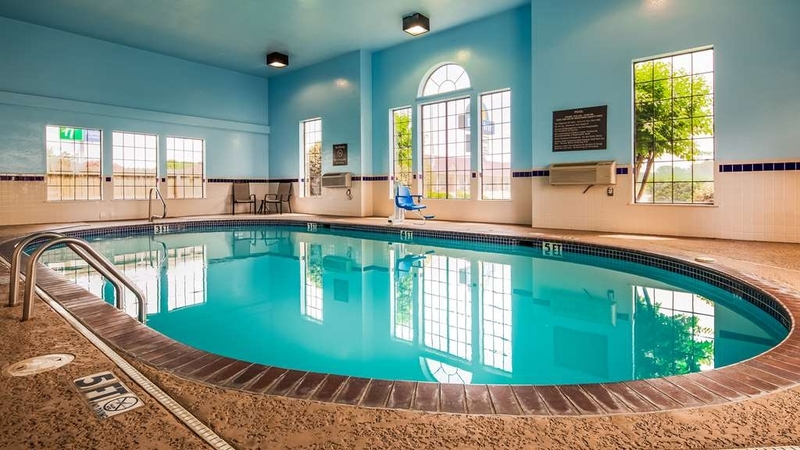 we had a 2 queen room,it was nice and roomy and clean.the employees were very nice and gave us free razors and shaving cream because i had forgotten mine.great indoor pool and good breakfast.would stay here again. Nice hotel, clean room and bath, the bed was comfortable.. Breakfast was good and there was plenty of food. Staff was helpful in suggesting restaurants for dinner. We will stay here again when we are passing through. We love this hotel. Friendly, helpful staff. They always treat us like friends. Great hot breakfast. Comfy beds. Conveniently located for our weekly trip. We always try to stay here on our way through. We absolutely enjoyed the best breakfast we have ever eaten at any Best Western Hotel, the kitchen staff was most helpful. The check in staff was most accommodating in our request to stay on the ground floor. "Some isssue, good for overnight, little expensive." I booked thru priceline and received a decent price even with the added dog fee. (Which is not cool, but my choice to stay here). Check in was fine, nice lady. The room smelled nasty of smoke and mildew. Bathroom was not clean, water was still in tub, pee on toilet and toilet paper not flushed. Disappointing after a long day on the road. Called the front desk, they changed my room. 2nd room did not smell, but had the same problem with the bathroom (makes no sense). They also had painted and not removed the plastic around the a/c unit. Not a big deal, but seems they should be following thru on making their rooms ready. I removed after checking with the front desk to be sure it was just painting remnants. Had biscuits and gravy for breakfast, which was good. Had a last minute request from work in Lonoke and saw Best Western on trip advisor and decided to take a chance. Book room by phone and with corporate rate it was $85 a night, which seemed a bit high for a best western, but needing to be in town by 7am I decided to risk it. Was checked in by the general mgr easily enough and the downstairs area appeared to be OK so I figured I may have gotten lucky. As soon as I got off of the elevator on the 2nd floor I was immediately struck by the musty smell in the hallway. It was pretty over powering, buy as I had no other accommodation lined up I went on to the room. Opened the room and was extremely greatful that the musty smell did not encroach into my room. The room was pretty good with a king bed, couch, table, and flat screen tv. Bed was comfortable, room appeared to be well cleaned, my only big complaint was the curtain above the ac. It sticks out above the ac unit & the fan catches it causing the curtain to billow out and catch all of the ac. I ended up putting the round bed pillow behind the ac to hold the curtain down which seemed to fix the issue. Tuesday morning when I got up there was no hot water, ended up taking a cold shower to be at work at 6am. Wednesday morning the hot water was back working, but the WiFi would no longer accept my room code. There are a very limited number of restaurants in the direct area to chose from and if you usually Uber like I do the wait seems to be roughly 30 min to go anywhere. Knowing what I now know, when I return I will stay in North little Rock and drive the extra 10 min in the morning and skip Lonoke and the best western. I will start with the good for the hotel: Location was great for us and the lady who checked us in was friendly. The room appeared to be clean and was fairly spacious. The breakfast was good and seemed to be fresh. But with all of this, one had thing can ruin it all. While taking a shower, I started seeing ants in the shower. When I got out, there were ants on the dresser and counter tops. I ended up with a few ant bites!!! Got home and my luggage had more ants in it and all of the clothes that I had. I called to let them know and they were aware of the ant issue but it had not been resolved. If not for the ants, I would have given a LOT higher rating!!! 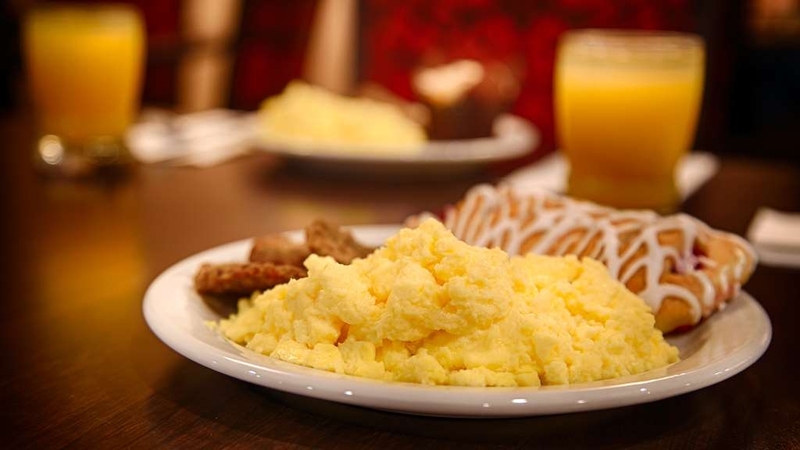 Two things we didn't like: the smell of the hotel and the quality of the breakfast items. The staff was super kind to us and I felt safe there even though it's next to a gas station. I noticed they've tried updating the hotel however it does still smell like a senior-living place which was bothersome. The AC unit needs either replacing or repair because it was taking in too much outside air which made our room extremely humid. Clean, quite, spacious rooms. Older building but fairly well maintained. Service was good and staff was friendly.?. Breakfast was cool and good selection. I would have given four stars if no for the rust ground the toilet. Heat and A/C system was not working properly, room was dirty. Employees was not friendly. When told of the problems their response was "sorry about that, have a nice day" Will not stay at this hotel or refer them to anyone. VERY unhappy with this hotel. 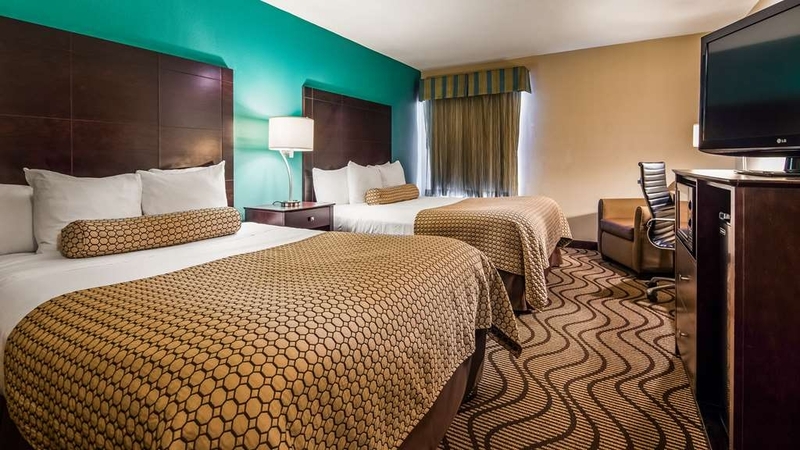 "Excellent location on the interstate and very clean room/"
The hotel was easy to locate. The staff were very welcoming and friendly. The room was very comfortable and the bed was amazing. We were only passing through for one night but I would recommend this hotel for an extended stay. Nice BW Plus. Breakfast was good but the breakfast room was small and there was no place for us to sit when we came down. The lady refilling the supplies was nice enough to open the adjacent conference room so we had some place to sit. The carpet in our room felt sticky so I made sure to not walk barefoot on it, but the bed was clean and comfortable. The lighting in the bathroom was a bit dim, but everything worked. AC was cold. Room smell a bit musty when we first arrived, but once the AC got going, I didn't notice it anymore. The employees were all very nice, so overall, it was a good stay. "Run away Don't stay here!" I stay primarily in Best Western hotels. Never again for this one though. The first room we were given, the bed and sheets were wet. The next room had ants. We didn't tell them about the ants because we were exhausted. The "hot" breakfast had cold biscuits with pasty gravy. Cold scrambled eggs. The only good thing I can say about this place was Jennifer who worked evenings, was very helpful. We like to get thru big cities when traveling so we don't have morning traffic the next day. Saw Lonoke on the map and that it had several major motels. Decided to try Best Western despite mixed reviews. It was just fine! We don't do around looking for minor issues and there weren't any! Clean throughout. No smells or odors as mentioned by previous reviewers. Big room with 2 Queen beds. Comfortable mattresses, lots of pillows. Very quiet. There ARE hair dryers-hanging in bag on back of bathroom door. Lots of hot water for shower, and a non-skid tub with grab bar. Breakfast was adequate (if you want gourmet, go to a restaurant or stay at a $200 night motel)! Coffee, juices, breads, rolls, bagels, cereals, scrambled eggs, sausage patties, biscuits and gravy and selection of fresh fruit. The pool looked lovely (indoor, heated) but was too tired to swim. And our room bath towels would have been ok for the pool. Don't hesitate to stay here. Oh, for great local food, take 31 south about 1-2 miles to Pruitts for some amazing fried catfish, home cooking and pies, and then head south another 4 blocks to Tidwell's Dairy store for great ice cream/custard. Friendly people, made our stay! The refrigerator didn't work at all. The room smelled musty. I was too tired to care but when I went to bed, I saw a couple of ants on the bedside table. All throughout the night, I battled ants in the bed. The bed itself would have been comfortable if not for that. I will never stay in a Best Western again. Avoid if you don't like dealing with really musty/stinky rooms. We complained to the desk when we checked in and the room they moved us to was no better -- seems a general problem with this hotel! At check out the manager avoided me, so no chance to try to offer a fix. Had a reunion in Helena Arkansas and the hotels there have been pretty "iffy". Stayed here and loved it. Booked the extra large room with the king bed and sofa. Clean, comfortable room and friendly staff! Huge 50 inch flat screen tv made my husband delirious! This was a good value for the price. We priced out the other hotels in that area and Best Western Preferred was $30-$70 cheaper per night for a good quality stay and breakfast. This was great for basic needs of a hotel. "Could be better for $$$"
Clean and comfortable room with friendly staff. Good value. Would recommend staying there to anyone in the Little Rock area. It is easily accessible to a major highway. Walking distance to a good restaurant. Great rooms and service for the price. Breakfast and rooms are well prepared and displayed. Everything you'd want in a trip just passing through. Can't ask for any better from Staff, Location and Hotel. 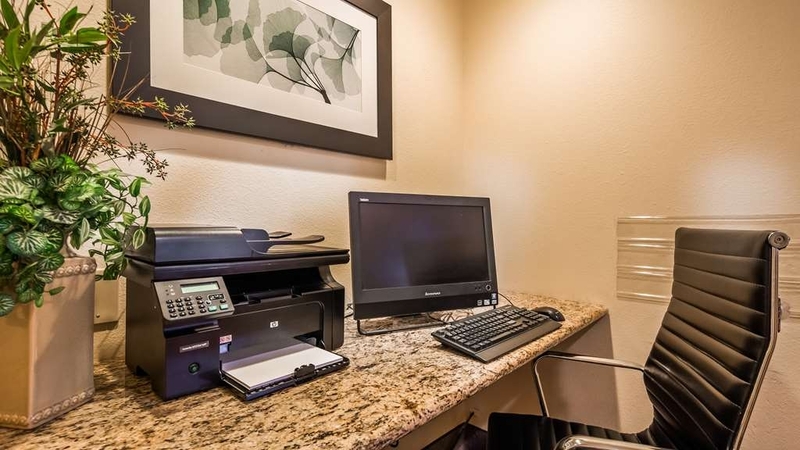 It does have a business room where you can wi-fi and conduct business as well as a Printer. Nice accommodations for the health nut needing to exercise. The pool is indoors and well kept. Very clean. Nice pool that was clean. Room was clean and has been recently remodeled Bed was comfortable! Air conditioning was quite. Nice breakfast but it should be opened until 9:30 on weekends. Otherwise good stay!! Excellent hotel! Easy location - decided to stop here as we were passing through on I-40 (opted for Lonoke, after reading some unfavorable reviews about Little Rock areas). Indoor pool - thumbs up! Staff - thumbs up! Cleanliness/comfortableness of room - thumbs up! Continental breakfast spread - HUGE THUMBS UP! Highly recommended. This Best Western was okay, but I don't know how the Plus designation is determined. The room was very small and left very little floor area around the king bed. Lighting was almost non existent in the room as well as in the bathroom...very dim and shadowy to try to see what is in our suitcases or fix hair or makeup in bathroom. The wash basin water has been minimized with an insert to make a very weak spray like a public restroom, not possible to rinse face effectively. The staff seemed to have been at minimum and it was nearly impossible to find help when needed. Pool had no towels and staff could not be found to get some. The heated pool was pretty cold. There was no staff present at breakfast. The waffle iron was not plugged in and a family with children had to wait while I discovered it unplugged and plugged it in. The sausage patties were so hard and dry that they were not edible. They must have been recooked from the day before. The overall impression was of an older establishment, somewhat updated, but did not rate the BW Plus designation in my opinion. There was no air conditioning at all in the corridors, making it feel humid and muggy. On the positive side, the bed was comfortable enough (though the springs did seem somewhat worn). 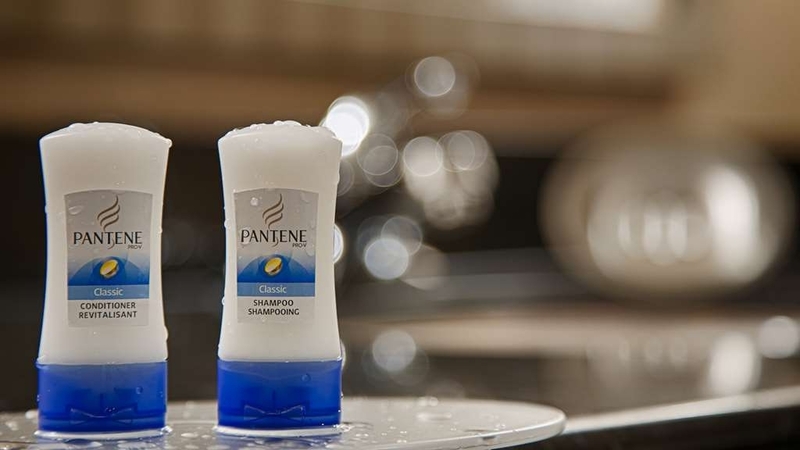 The most positive feature was the hand held shower for rinsing my very thick long hair. The room appeared clean. Access to the highway is convenient. We chose this inn for the chance to eat at the nearby Pruett's restaurant for their delicious catfish. This is the place where the middle becomes accessible whenever a end around takes the first step in a long path for the entrance of a slumber sort of stay since a timing is of importance for the many ways of access. "A nice property with some flaws"
On our way east we decided to pass through Little Rock and stay here. The property has a pleasing appearance and there is plenty of parking available. It has been highly rated on TA so we had no fear of getting disappointed. The staff was excellent. Rhonda, the front desk person was very friendly and professional. Our problem was the room we were given. It had a terrible odor, something like a "wet dog" smell. We turned on the AC and went down for more items to bring up to the room. When we got in the room the second time we still smelled the offensive odor. We went back to Rhonda, told her the problem and we were immediately given another room which smelled much better. Breakfast was an enjoyable experience with plenty of food items available. The dining area is sufficient to seat many guests and was kept clean at all times. The Wi-Fi was adequate in all areas of the hotel. The property overall is clean and well maintained but there is no guarantee that any particular room assigned will not have had pets in it prior to giving it to another guest. In our travels, it isn't unusual to see guests smuggling dogs into rooms without notifying the staff. Rhonda told us they try to keep the pets on the first floor but some people ignore the rules and sneak pets into rooms. Great place to stay if travelling interstate 40. Convenient location. Easy access. Clean, comfortable room. Quiet -- could not hear the neighbors in next room. Staff was courteous and professional. Would stay here again. "Great stay at Best Western Lonoke"
This is a very nice motel. Room was clean and breakfast was good. If you are in a wheelchair, be sure to ask them if they have a walk-in shower. The handicap room had support bars, but no walk-in shower. We would definitely stay in this hotel again. The quality and cleanliness suited the rate. The bed was comfortable, bathroom was sparking. Hats off the the cleaning staff for showing pride in their work! we just drive for fun to different route and finally we find this place seems to be reasonable stay so we did. we did enjoy. and let the front desk know about my concern they took care of it quickly. they did good job. Thank you sharing while you were still here. that is greatly appreciated. we can only fix what we know about. If a guest is happy with the response and subsequent actions taken then we are doing our job. Thank you again. Not as good as other Best Westerns we've stayed as recently but it was OK for one night. And only restaurant nearby was a not-too-great Mexican. But it was conveniently located for our travel and easy on and off the interstate. Thank you for sending us your view on your stay. We are always happy to hear from our guests and their feelings. We would enjoy having you come back and see us again soon. "Great room for the price." The room was clean and very comfortable. We were 4 days into a cross country road trip from out west. The staff was very friendly and helpful. The breakfast was very good and the breakfast area was spotless. Thank you so much for taking the time to share your thoughts and feelings regarding your stay with us. We are always happy to see and hear that our goals were achieved by making our guests happy and comfortable. Please come back and see us again. Room, the bed, the shower are great. Everything worked. Clean and comfortable. The breakfast of scrambled eggs and sausage one of the best I have had in a hotel that provides breakfast. All for a very reasonable price. It is the sort of place that just makes traveling better. I would not recommend this hotel to anyone. Its an old property, and I cannot see how it is rated a "Plus". For example, the breakfast was terrible, the coffee cold, the eggs/saugage runny/greasy. They still use the old type soap bar. Walls/ceiling very thin. Noisy all night. I would rate this hotel a "Minus." vs a "Plus." Will not ever stay their again. My husband & I spent one night here on our way to Nashville from Galveston. We couldn't have been more pleased. The hotel room was spotless, the staff courteous,the beds comfortable & the breakfast better than most. Checked trip advisor reviews, so stopped here to get out of Little Rock morning traffic. Nice motel, decent beds. Not much in offering for eating if wanting to walk. Ok rates for small town. Would stay again. Clean and well maintained and excellent staff. We were very happy with everything during our stay. Price of room was reasonable and very good considering the quality of the service. We will stay at this motel in the future. Best Western in Lonoke was clean and fresh. Desk staff was professional but friendly and helpful. This is a short distance out of Little Rock and therefore gets you beyond the morning traffic on your way East. After reading the reviews, my husband and I decided to give this place a try while traveling on I-40. 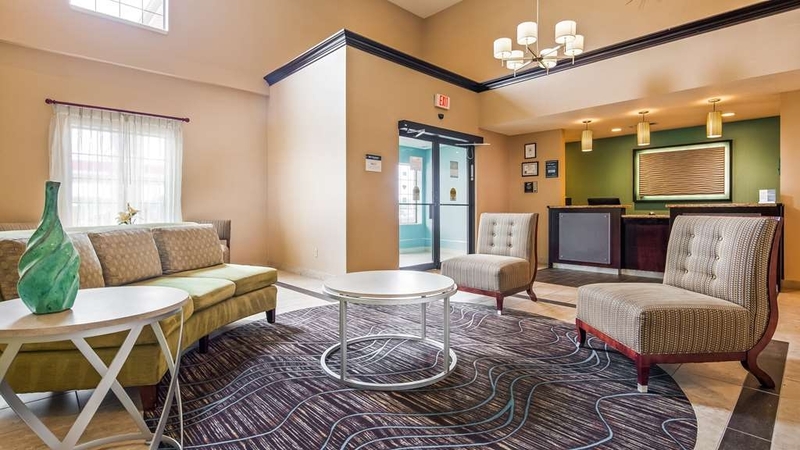 Room is clean, affordable and bed comfortable; friendly front desk staff. All made for a nice stop on a long journey! This hotel was clean with modern decor and all interactions with staff were pleasant. My husband and two preschool aged children stayed for two nights while attending my sisters wedding. All of our needs were met and would recommend a stay to anyone. My oldest and I attempted a dip in the indoor pool and it was a little cold for my taste but didn't seem to phase the five year old. Always a nice feature with kiddos. Thank you for taking the time to let us know about your family's stay. I am so glad the toddler enjoyed the pool. It can be a very happy place for kids when away from home or particularly so when weather does not permit outside activities. We would be only too happy to welcome you back during your next visit to our area. For the price, this hotel was a great deal. I had several choices at that particular exit on I-40 but decided to give this BW Plus my business. It looks to be a newer hotel with clean, pleasant exterior. Plenty of parking and welcoming desk staff. The room was large and nicely furnished with chair, ottoman, king bed, mini fridge, microwave. The bed was super comfortable. I would have liked slightly higher wattage light bulbs in the bedside lamps, however. The otherwise crisp white coverlet had what appeared to be old stains on it which weren't apparent in daylight but appeared under the artificial light of the lamps once the room got dark. Otherwise, the sheets themselves were clean and white and well fitting and didn't bunch up. Hooray for this hotel using fitted bottom sheets, something the higher end hotels just can't bring themselves to do. The bathroom was clean and spacious with plenty of towels. The only problem I had was that there was no hot water at 5:30 AM. I had to get on the road very early and when I turned on the tub faucet I could not get hot water, no matter how long I let it run. Same for the sink. I ended up washing up at the sink using cold water and a face cloth. Otherwise, a good stay, gas station and a fast food restaurant conveniently next door. Good internet connection. Thank you for your kind words and also for letting us know where we may have fallen short. I apologize for the problem with the hot water. This is being investigated right now. When you are in the area again, I wish you would call me directly and I would only be too happy to arrange for your next stay with us. Thank you for taking the time to share your feelings about us! It gives us so much to go by in the customer service area if we know what is good and yes, the not so good as well. How else would we better serve if we did not know both? thank you again and we wish you safe and happy travels. Nice clean and comfortable room and property. After driving 10 hours today, the neighborhood felt safe enough to take a 45 minute outside walk around the area. I'd like to mention Leslie (front desk). She was so helpful ( making a fresh pot of coffee) and recommending a local restaurant. She didn't steer me wrong. Leslie had extra time for every guest that inquired about anything. I would make one suggestion: have additional parking area for vehicles towing RVs and/or trailers. The neighbouring motels do have this available amenity. Thank you so much for sharing your feelings with us. Leslie is a shining star here and I am proud of her just as I am the entire staff. I am sorry that you did not realize that the entire adjacent lot is ours and is precisely for large truck and RV parking. Please come see us again soon! It was late at night and I was getting sleepy. I was looking for a hotel with higher star ratings but had to sleep. The location was easy to get to. The staff was friendly. When I got to my rom I was surprised. It looked brand new. Very clean and was equal to a much more expensive hotel in quality at half the price. You won't likely be disappointed. I am so glad we were able to pleasantly surprise you! We strive to achieve ultimate guest comfort and accommodation. It is not always easy to find just the right place at night on the road. We are thrilled to have been the one for you! Hope to see you again sometime soon. Have safe travels. 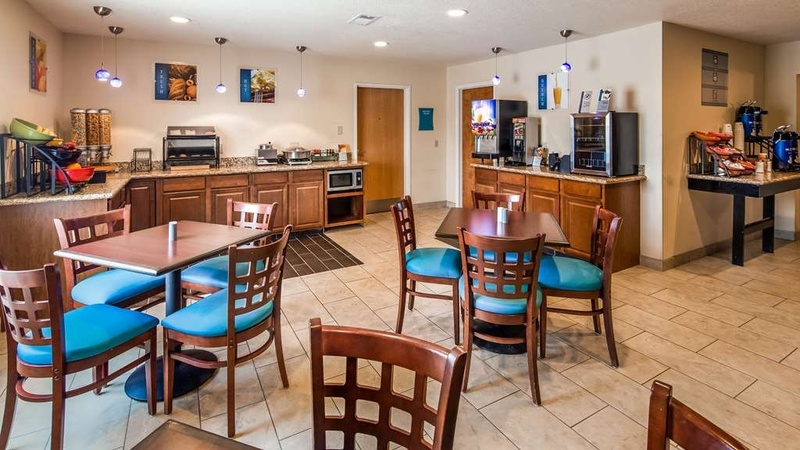 It was a great place=welcoming, helpful, personable staff, --location easily found, looks fairly new- rooms was clean,& nice--great value-plus I'm a Best Western rewards member! stayed for only for one night - I would recommend if you are in the area. 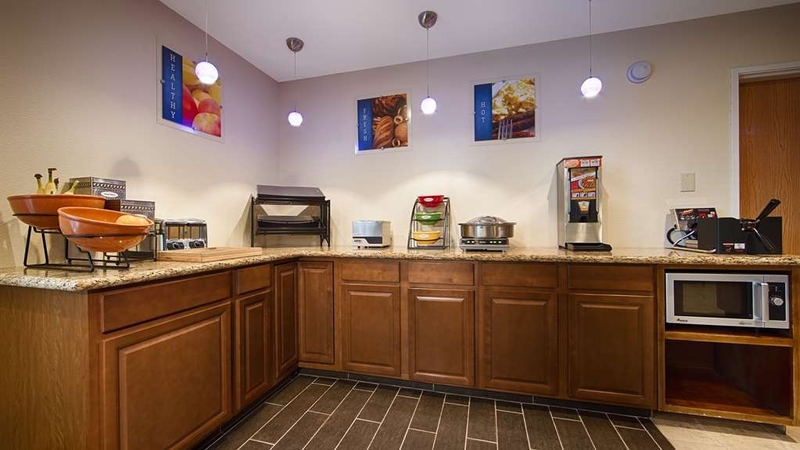 Room easily accessible to interstate, nice and clean facilities and great free breakfast! Really good service at the front desk and very helpful. It was a pleasant place to stay on our way to the 'west'! "Our go to in Lonoke"
We stay at this hotel every time we go to this area, every couple of years. We keep going back because the beds are very comfortable, it's always clean and quiet, the staff is great and the breakfast is good. We stopped on our way to Nashville . Location was great a lot of places to eat. The room was good size but the furniture had not been cleaned there was dried white fluid all over the front of ottoman and dark stain on chair. There were some stains on sheets too. The food was ok. Thank you for taking the time to share your views with us. We appreciate knowing how we are doing and the guest is the best measure of that. I always like to stress that any issues or problems should be brought to our attention right away so we may remedy them and therefore make your stay a more enjoyable one. We thrive to make your experience a good one from beginning to end. Please consider coming back and staying with us again soon. Everything was clean - from front desk, room and bath. Front desk personnel was very pleasant and helpful. Just off the Interstate, but quiet. For traveling through, everything we needed was very close - food, gas, and stores. It is always appreciated greatly when our guests take the time to let us know about their experience with us. While we know in general terms how we are running nothing is more to the point than that of the guests own experiences. We are happy to know that we did not falter in your expectations. We would love to see you come back and see again soon! Really enjoy staying here. Very friendly and helpful staff, great breakfast (she goes out of her way to make sure we are happy), comfy beds. We travel through here every week and stay here as often as possible. Thank you mam for letting us know how we are doing. It is always a pleasure to see our guests leave here happy. I feel that having to face a long drive in the morning is always a bit easier if I have gotten rest and a decent breakfast to start off the day. Looking forward to seeing you both soon! Located right at the I-30 interchange. Reasonable rate. Well lit corridors. Good clean rooms with good air conditioning. Large flat-screen TV. Updated bathroom with excellent shower. Good breakfast -- eggs, sausage, waffles, etc. -- and local restaurants nearby. Elevator. 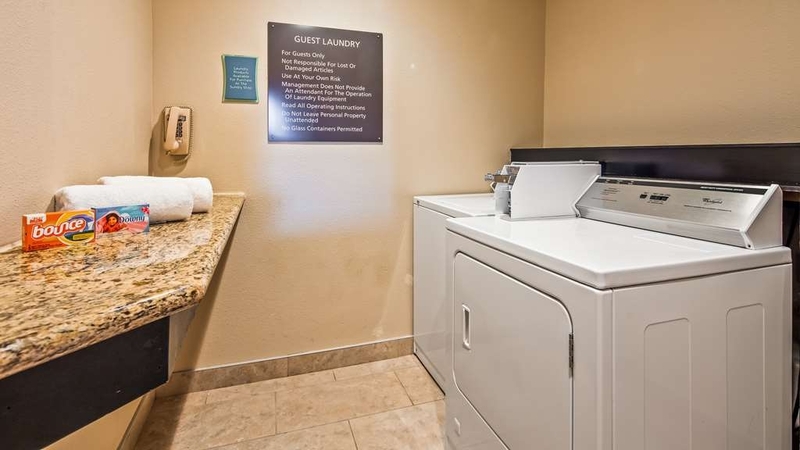 Indoor pool, workout room and coin laundry. Ample parking. Good value for your money. Thank you for letting us know how much you enjoyed your stay with us. We are always glad to see our guests comments and opinions. We feel it is one of the most valuable tools we have for measuring our success in delivering top notch customer service. We hope to see you again soon! Thank you for taking the time to share your thoughts with us. Your opinion does matter to us. Sometimes during the summer months when humidity is high it takes a bit longer for the carpets to be completely dry after shampooing. I apologize if this was the case during your stay. We would be very happy to see you return to stay with us again soon. We chose this hotel because we had hotel points to use from previous Best Western stays and are generally happy with the Best Western Plus hotels but this one was less than what we had expected. The bathtub was not clean (had hair in it) and the A/C unit was not working properly and made a loud noise all night and the closet door magnet that was supposed to keep the door closed was held on by a 3-4 inch strip of blue painter's tape. On a positive note, the carpet and bed spread looked new and very nice but the rest of the hotel really needed taking care of. Just didn't seem to attain that "Plus" rating. We stayed at this hotel for one night on our way back to Illinois from Houston. The hotel was clean & our bed was comfortable. The TV did not have a great picture on some channels, which was odd because the hotel is in a town just north of Little Rock. I got up at 5:00 in the morning to take a shower. Despite letting the water run for a very long time we had no hot water. So we packed up & loaded our van intending to shower when we got home. When I notified an employee about our water situation she apologized & said she'd get some hot water coming our way. Really?! Our room was at the end of the hall. My mother-in-law's room was closer to the lobby & she did have hot water. While this hotel was clean, not automatically having hot water is a deal breaker for me. We will not stay here again. Thank you so much for taking the time to give us your review. We are always glad to hear from our guests, even if it is not good news. I apologize for you inconvenience and would like to win you over for a return trip to stay with us. Please feel free to contact me personally and hopefully we can work something out. Last night out on a stressful week long trip. Found the most peaceful Best Western I've stayed at - ever. No traffic noise (though I-40 was a quarter mile away), room temperature perfect, no "noise seepage" from hall or other rooms. Just a clean, quiet, comfortable night's rest. Thank you so much for taking the time to send us your thoughts. At the end of the day during a long trip rest and peace are 2 of the most important things we would all hope for. I am pleased to see that we are succeeding in providing that for our guests. We understand how much the "basics" can mean to a tired weary traveler. We wish you safe travels and hope to see you again soon. I stayed here on my way to the east coast from Texas. I have two dogs, around 40lbs each. There was a $16 pet deposit which was refunded at the end of the stay. I sometimes worry about pet hotels being a bit "drab", (I don't travel with the dogs often) however this hotel was a pleasure for all of us to stay in. I want to rave, specifically, about the staff. They all were absolutely wonderful. The concierge I booked the room with earlier in the week was a pleasure to work with. He helped me get the best rates and was super sweet. He even put us next to a side door for added convenience when taking the dogs outside. We ended up arriving a little after midnight & when we arrived, the ladies at the front desk were very cheery and made us (including the dogs) feel welcome. The room was great as well. The lady working at breakfast the next morning was lovely and kept the area very clean. We all know how messy some people can be when it comes to hotels...and the area was spotless. Overall, it was a great stay and I will definitely be staying here with the dogs again the next time I make the trip to Texas. Well as the GM, you have made my day! I take care when hiring staff in that I want only those who want this type of job. If a staff member does not like what they are doing, it will show every time. We have a good little family here and I am proud of their performance. Thank you for letting me know how well we did. I am pleased your experience with us was such a success. Safe travels to you (and the dogs) and hope to see you again soon! "Didn't get to stay here, but the Best Western manager was great!" We had booked this room because we had planned to attend a class in nearby England, Arkansas; the class was cancelled, so I checked my confirmation email to cancel the reservation. What I had missed when booking was that I had (for the first time) booked not through Tripadvisor, but a company called Agoda. Their policy is that unless you cancel prior to 3 days in advance, you will still be charged for a 1 night stay. I missed this little detail when originally booking the room. All I can say is: DO NOT BOOK ANYTHING THROUGH AGODA! The rep who answered my call claimed it was Best Western's policy that the reservation had to be cancelled 3 days prior; I know that is a lie, because we have stayed at Best Western hotels all over the country, many many times. She called them, and at the same time, so did my husband. The manager said he had just gotten off the phone with her, and that it was NOT their policy, they had not charged our credit card. We checked with Visa; the charge had been made from an off-shore company (Agoda). After over 40 minutes of the rep explaining the same thing over and over, we finally got her to check with a manager (they wouldn't talk with us directly) and got our charge refunded. The rep said that Agoda was a "sister company" of Tripadvisor. All I know is that I will be MUCH more careful when booking rooms in the future, and may not book through Tripadvisor again. Again, the Best Western manager was great, friendly, and even let us know that the price Agoda tried to charge us was more than we would have paid had we booked directly with him. I'm sure the hotel is lovely; we will most likely find out for ourselves in the future. Thank you so much for taking the time to let us know how we helped in your recent experience. We do try as best we can to aid in getting any special needs taken care of right away. We are always glad to cooperate when we have the ability. We are always here and would be only too happy to handle any further arrangements for you. Safe and Happy travels to you and hope to see you again soon! Great hotel. The staff is very friendly. The room was clean and updated. Very comfortable bed and pillows. Breakfast was great, could use some hard boiled eggs though. Second time staying at this hotel and it has not disappointed either times. How nice to hear that you came back to stay with us again. We so enjoy hearing from our guests regarding their experience and extra happy for a return visit! We wish you safe and happy travels and hope to see you again soon! We like this place. The rooms are clean and in good condition. The people working the front desk are always nice and very helpful. This place is easy to get to right off of the interstate. There are several restaurants close by so you don't have to be hungry. Thank you so much for taking the time to share your experience with us. We are always happy to hear from our guests. We are so happy we did not disappoint. We wish you safe and happy travels and hope to see you again soon. We got to the hotel around 9pm and left by 8am the next day but the hotel was clean and quiet. The front desk staff was very nice and pleasant. The breakfast that's included had something for everyone - eggs, Bengals, cereal, fruit, coffee, tea and assorted juices. We didn't stay a long time but our first impression was great. Best Western Plus is really nice and clean! Bed is comfortable, and decor is updated. The staff were accomodating. This hotel is easily accessible from the interstate. There are fast food places nearby. 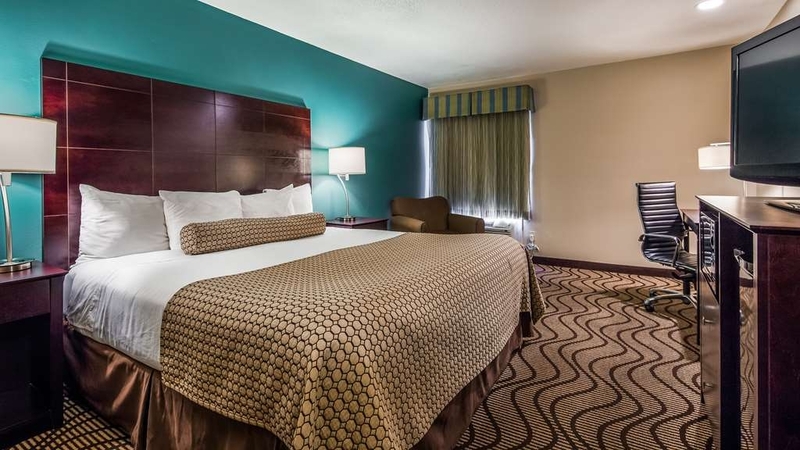 Very Pleasant room, very comfortable bed, updated decor & linens. We slept like a log. Good hot or cold breakfast, convenient location, convenient for restaurants & gas stations close by. We will stop there again on our way to Tulsa to visit family. Thank You! We look forward to seeing you in the near future. Give us a call and we will be waiting for you! Very friendly staff and great value for the price. Perfect overnight stopping point on our long trip capped off with a swim in their very clean indoor pool. We will most definitely be staying there again in the future! We are so happy to hear of your plans to return. We would love to hear from you and welcome you back. Return guests are awesome. It gives us all a chance to learn a little bit more each time about one another and often forms a nice relationship! Nice place to stay. We were upgraded to a suite, which was very comfortable. Breakfast was good. The location was good - just right off the freeway. Service was good and staff friendly. What more can we say?? Thank You! We are so glad to know that we delivered what you expected and you were not disappointed. Guest satisfaction is key to the success or failure of any business. We just think about what would make us feel comfortable on our own travels and apply it here! We made the reservation while on the road and were very pleased with the lobby personnel, the room and the breakfast. 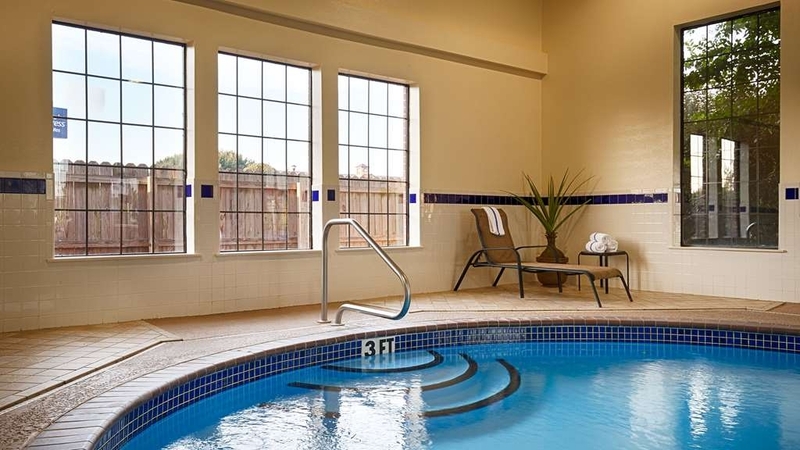 We have expectations about Best Western and were not disappointed. It was clean and comfortable and the people were friendly. Thank you, Best Western. "Nice and clean, super friendly staff!" All staff that I encountered were friendly and helpful. The area was safe, the hotel was clean, and everything was perfect! Breakfast was super tasty! I hope to be able to stop here again sometime!!!! "Very clean and the people are very nice"
No complaints about this location at all! Everyone was very nice at both check-in and check-out. The room was extremely clean. 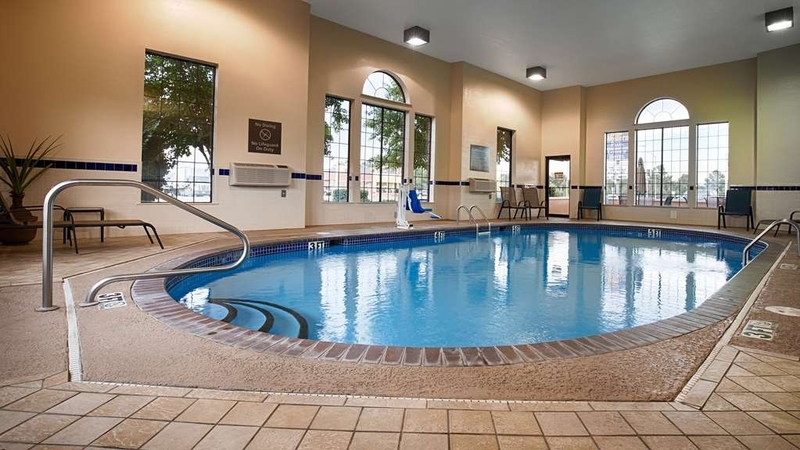 It has a real nice indoor pool and fitness room. Good coffee at this location and a good selection of breakfast items. "We will stay again. Deserves a 10 star rating." The internet rate was lower but I received the lower rate when I asked, plus my senior discount. Front desk person very nice, helpful and informative. We arrived late and had to leave early so didn't get to use the exercise equipment or the heated pool. The king bed was perfect and no sag toward the middle. The room had a desk, recliner, microwave, and refrigerator. The bathroom was stunning with it's large granite top and all black accessories including the large black-framed mirror. The bathtub had a no-slip surface built into it. Breakfast was delicious. The hot foods were sausage, eggs, biscuits and sausage gravy, waffles AND SUGAR FREE SYRUP. I am an insulin dependent diabetic and rarely find sugar free syrup. Thank you very much to the person who made that decision so I could enjoy a waffle. Clean, quiet, comfortable, like-new appearance, what more could you ask for? Happy Days when you get a good night's rest! Am I right? I know I have had a few experiences with the sagging mattress and that just kills my back. We are very proud in that we do not allow or expect our guests to sleep on a mattress that would not give them a good night of real rest. It just makes good sense that a good night of rest and a good breakfast make the start of your continued journey much easier. We wish you safety on all your journeys and hope to see you again soon! "Very comfortable for overnight stop"
The desk staff was helpful and gave online rate even though I arrived in person without reserving ahead because I mentioned that it was cheaper online and asked if I could get the better rate by walking outside and doing it via smartphone. The room information says there is a sundries/food store within the hotel, but there isn't. There is, however, a McDonald's with the newer Cafe items across the street - it's very easy to get to. The room was very nice, very clean, and the bed was especially comfortable. There is a pool and a fitness area. It's just off the interstate in a rural area before a small town. If you need items, there's a Walmart very close. The hot breakfast was plentiful - with belgian waffles, biscuits and sausage gravy. WiFi excellent. Thank you for your feedback! We love hearing from our guests. 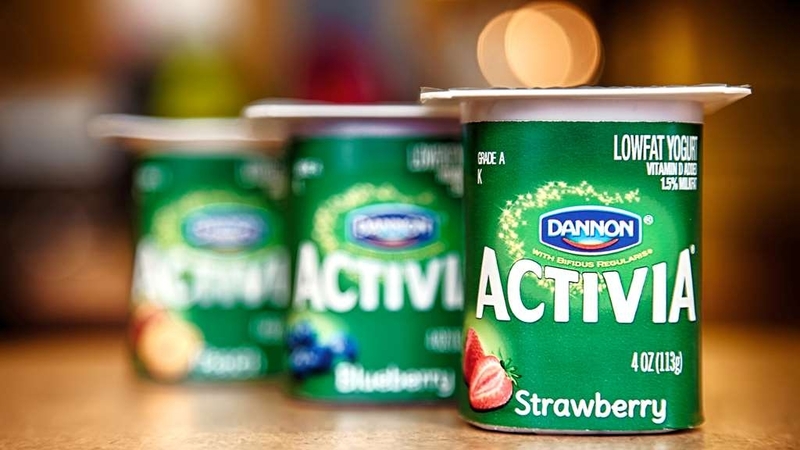 We do have sundry items available through the front desk, in addition to the vending machines. I am sorry you were unaware of that. We are always ready and willing to accommodate our guests when walking in the door whenever possible. I am happy to see my staff delivering good customer service. Although I do not care for that term myself, we do not have "customers" here, we have "guests". In our hearts there is a big difference. 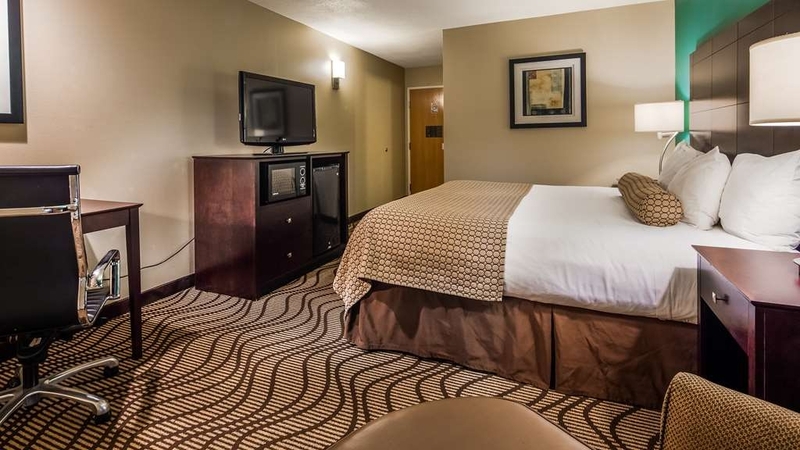 "A gem on I-40 in Arkansas"
A clean comfortable room, friendly staff ... very pleasant experience ... a gem on I-40 in Arkansas .. we were so pleased we stayed on the eastbound (return) trip too! Looks like more (food wise) may be coming to the surrounding area. Thank you so much for taking the time to let us know how your experience with us was. We do love to hear from our guests! 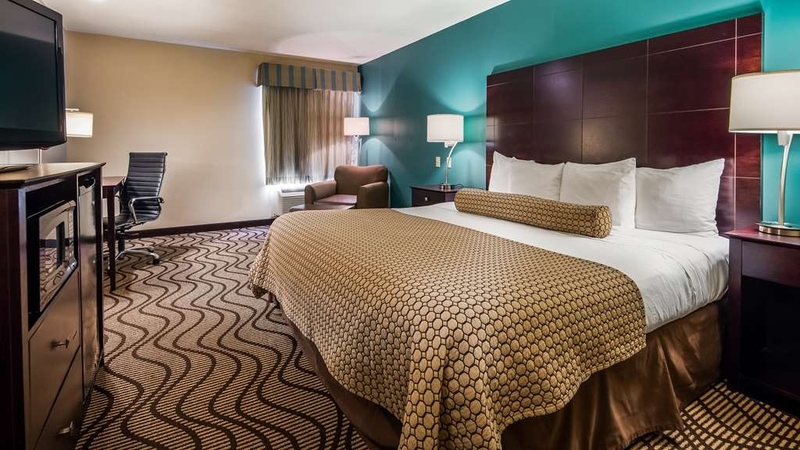 Clean, comfortable, yes those are at the top of our list of goals for our guest satisfaction. Our little community is growing more each day. It is exciting to see so many new neighbors. We know that it can be very frustrating while on the road to find good places to eat. For a small community we do have a wide variety. We look forward to seeing you again on your next trip this way. Be safe on the road. Stayed here on a cross country solo driving trip. Room was clean, comfortable and quiet. 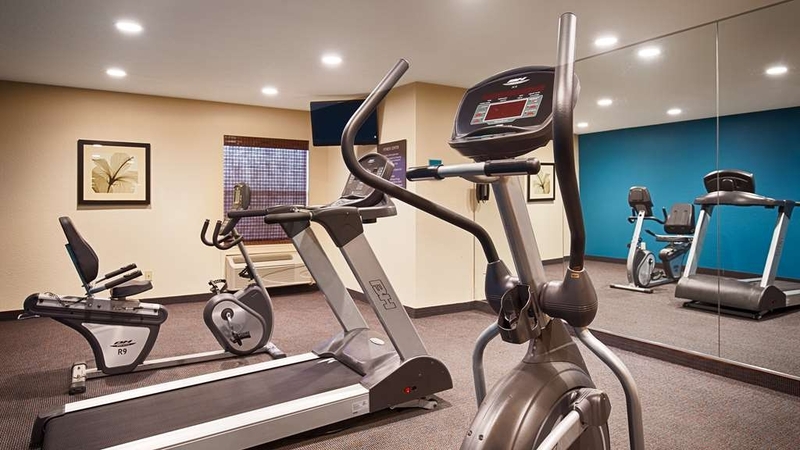 I was happy to find a small fitness center where I could use the treadmill for awhile after a long day of driving. I thought it was a touch expensive. For some reason i never got a receipt, although the previous night, also at a Best Western, the front desk person asked if I wanted my receipt under the door or emailed to me. Thank you so much for your feedback. We too, offer the choice of email or under the door for receipts There are a few exceptions that sometimes apply though. If you booked through a 3rd party and paid them there would be no receipt. If you were staying on a free night through BWI there would also be no receipt. We do also refrain from offering under the door receipts in the case of a room with a pet. Sometimes our furry friends get upset when the receipt is put under the door and this could create a disturbance that would wake others in the surrounding rooms. If you would like, I could send you a receipt if you would call and let me know. "Good for overnight when traveling." Checked in late (10:30), but was quick and pleasant. Room had a musty smell at first but went away. Room was clean. Dizzying carpet pattern and ugly hallway carpet. Bathroom fan needed cleaning. Nice tub surround! Room had micro/fridge. A/C had an air diffuser to keep from blowing up under the curtains. Good idea!! Hotel is easy on and off the interstate between and gas station and another hotel with McDonald's across the street. Thank you for taking the time to let us know how we are doing. We place a high value on our guests opinions, thoughts and needs. We are always glad to get your feedback. We hope your experience will bring you back to stay with us again in your future travels through Arkansas. Staff is outstanding, great location from the hustle and bustle. Rooms are spacious, clean, comfortable! Plenty of outlets scattered in the rooms for all your electronic needs, such powering your essentials, wifi is really good! Great price for the accommodation! Highly recommend!!! Comfortable place to stay for the night while driving through Arkansas. Room was large and there were two comfortable queen beds. I always have to get rooms with free internet because of work and it worked great. That does not always happen. Breakfast was ok, however, I have had better at other Best Western's. We were pleased with the quality and staff. We stayed at this hotel while traveling home from visiting family during the holidays and the lobby was beautifully decorated. We would recommend this hotel to travelers. We love Best Western! Overall good experience with reasonable pricing. Great location with helpful staffing and decent breakfast. Clean and well attended to location. Seemed safe with easy access for traveling. Had a little computer issues with check-in but the front desk clerk was very nice. Thank you for taking the time to send your feedback. We love hearing from our guests. We are not giant, but our hearts are big as the outdoors. We love seeing our guests are comfortable and able to relax and enjoy their stay with us. We look forward to seeing you again soon. Many areas of the I-40/I-30 route through Arkansas do not have the lodging accommodations that I desire. This Lanoke Best Western was super. When we checked in, the desk clerk offered us the option of a free room upgrade to a pillow-top bed. After a 6-hour tedious drive in the rain and fog, this was much appreciated. The staff lived up to my Southern hospitality expectation. The room and bath were large and super clean. Bedding was comfortable and I loved having a large bath vanity! 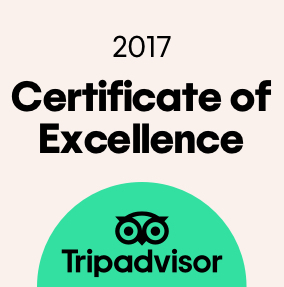 We got the best restful sleep of any of our recent travel stays. We were so pleased to see we had a hand in a long tedious day ending in comfort and relaxation. Our goal is to welcome our guests as if this were our own home. Some travels are not always planned and most folks try to make the best of it. I hope we can always lend that bit of hominess that so many find comforting on the road. We look forward to your staying with us again soon. "A nice place to stay." We were very happy with our stay at the Best Western hotel. The room was clean, comfortable and quiet. The breakfast was fresh and good and had a variety of items to choose from. We will definitely stay here again if in the area. Thank you for sending us your thoughts regarding your stay. We rely on our guests feedback to measure our success. Our little community is very homey and welcoming to visitors. I liked it instantly when I came here 16 years ago and never left. We look forward to your staying with us again in the near future. I stayed here on my way to and from Louisville, Ky. I had a dog and there was plenty of grass which was nice. Also a convenience store right in front of it. Very friendly service and a very clean & always felt safe walking my dog at night. The only problem was I was on the highway side and it was a little bit loud. I would for sure ask for a room on the opposite side of the highway. Other than that I really enjoyed my stay. Thank you for taking the time to give us your feedback regarding your stay. We love to hear from our guests. it is the best measure for our success. We are only too pleased to accommodate our guests preferences whenever possible. Call ahead and we will surely put you on the opposite side. Thank you again, and be safe on your journey's. Thank you for taking the time to give us your feedback. We love hearing that our efforts are successful in making each of our guests feel welcome and comfortable during their stay with us. We look forward to your returning to stay with us. We promise we will have the same breakfast waiting for you! Greeting was excellent, all hotel staff friendly. room was very nice, breakfast was one of the best at a hotel, for the price i could not believe the great service. One of the nicest hotels tostay at, even one of the nicest Best Westerns. All peeople very friendly, especialy the on i booked the room with. Highly recomend to anyone staying in the Little Rock area. thank you wll for the great experience. "Great place for the price." Rooms were clean and quite. Can't beat the price. Included a nice breakfast. This is a great place to stop in if on a road trip and need to lay your head down for a good nights rest and not pay a fortune. very clean and rooms and décor and amenities were great. I would recommend this to travelers. I was travelling alone, so I wanted a Hotel with inside doors. Staff was great in informing me of near by eating places and of those that delivered. Will definitely make this on my return trip. Thank you so much for taking the time to let us know how we are doing! We love hearing from our guests and their experience with us. We like to give assurance and guidance to our lone travelers. I am very happy we have interior corridors myself as I feel more secure when I am traveling and find them. You always have a home away from home with us! Safe and happy travels until the next time! The hotel looks very nice and modern but it took checking 3 different rooms before finding a nonsmoking room that didn't smell like smoke. The lady at the front desk was very helpful but when you are tired and just want to settle into your room for the evening having to go to several rooms is not appealing. The room we finally got was nice. It still had a smoke smell but much less than the others. The bed was comfortable and the shower was nice. Breakfast was OK. It was the usual hotel food. Thank you so much for sending your thoughts to us. We are always glad to hear from our guests regarding their stay. I am sorry you had to make so many moves. Unfortunately, some folks do not obey the rules for not smoking while staying at hotels. We do run an ionizer when this is discovered, but sometimes just that bit of a hint is only evident to someone who is more sensitive. It would make us very happy to have you return some time and perhaps check the room out yourself before checking in. Several guests do that regularly and it is perfectly fine with us. We are only happy if you are happy. Safe travels until next time! With all the glowing reports of Best Western Plus, I decided on this place because of it's competitive rates. I'll go with the good first: Very friendly staff and check-in/out was easy and accurate. No problems with bill. The free breakfast is pretty standard for these places, but the waffle maker always makes my day. Internet was pretty good and easy to use. Room was clean and well situated and quiet. I liked the fact that there are some restaurants that will deliver to your room if you don't want to go out. The bad: The smell that greeted you when you entered the building was a little appalling, and I'm afraid it colored the rest of my experience with the the hotel. Very chilly and musty and a little more sticky humid than I was expecting. Even the room was excessively humid. I've been in hotels in extremely humid environments, and I felt that it could have been handled here a bit better. The shower handle was also a bit loose and inaccurate. So with all that, it gets an average rating from me. Thank you for taking the time to share your experience with us. We are always glad to hear from our guests regarding their stay. We hope you have the opportunity to come back and stay with us during a less humid season. We wish you safe travels along the way! This is one of the best hotels we've stayed in. The location is very easy to get to. The staff is very good. They recommended a Mexican restaurant nearby that was great. We would definitely stay at this hotel again. Thank you so much for taking the time to share your experience with us. We are here to make all our guests happy and comfortable. We hope to see you come back and see us!